The smart-me 3-phase Meter is a precise high-performance energy meter with a built-in Wi-Fi interface. No additional hardware is needed for the integration into the smart-me cloud. The meter uses the existing Wi-Fi network and can be easily controlled and analysed via the internet. This is the easiest option to visualise the consumption of energy with the help of a smartphone, a tablet or a computer in real time, to analyse the metered data and to optimise the own-consumption. The connection possibility of three phases allows the incorporation and supervision of whole apartments, entire buildings or complete company sites with low investment costs. The smart-me Meter is the first Electricity Meter with a direct connection to Cloud. So you can control and monitor him from anywhere with your Smart Phone, Tablet or Computer. You don't need any additional Hardware. The Meter connects to the existing WiFi Networks and this allows you to view your Energy Consumption in Real time! An incredible cheap solution to make your Energy smart. For up to 80A (18.4 kW). Smart-me is an energy and power meter, a remote switch, a time switch and a temperature meter all in one device. It’s connected to your Wi-Fi network and you can control and monitor smart-me from anywhere with your smart-phone, your tablet or your computer. Smart-me is a high quality (class 1) energy and power meter. In addition to power, the device measures energy, current, voltage and power factor. For optimal accuracy every device is calibrated at production. We guarantee an accuracy of 99% (max. 1% error). Smart-me is also a temperature meter. You can monitor the temperature from anywhere. Smart-me is also a remote switch. You can switch on or off the power remotely, using either your smart-phone or from the web. Smart-me is also a time switch. On your smart-phone you can configure when smart-me should switch the power on or off. The smart-me device is connected to your Wi-Fi Network at home and communicates with the smart-me Cloud Servers. With your smart-phone, or a simple web browser, you have access from anywhere to your smart-me device. The security of your data is important to us. As such, every connection is encrypted and your data is stored anonymously on our servers. Of course, we will never sell your data to advertisers or other third parties. Our servers are located in Germany / Switzerland. Smart-me is a lot of things, but first it's a high quality energy and power meter. Smart-me has a high measuring range and an extremely high accuracy, so you can also use it to measure low power consumption such as Standby usage. To guarantee the best measurement accuracy every device is calibrated and tested by hand. The device measures the energy in both directions (import and export). This means you can use it to measure your consumptions and you can use it to measure your productions (e.g. from a photovoltaic system). The measured values are: Energy (kwh), Power (W), Current (A), Voltage (V), Power Factor (cos phi). What do I need for smart-me? 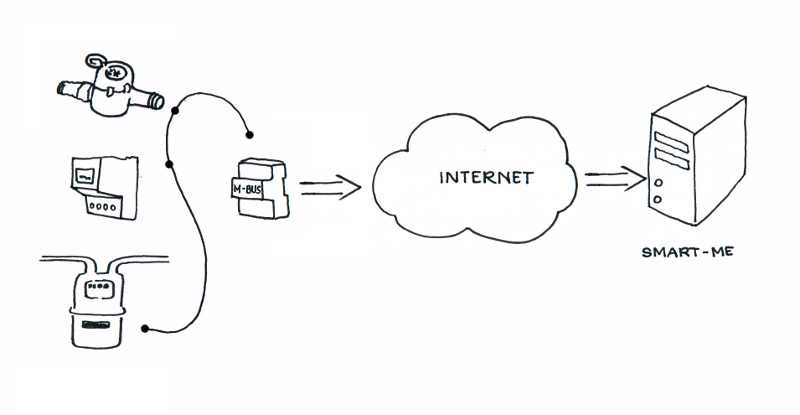 Smart-me needs a Wi-Fi network to connected to the internet. To set up the smart-me device you need an Android or IOS smart-phone or tablet. To access your device you need to set-up a free smart-me account. Gateway to the smart-me Cloud for up to 50 M-BUS Meters. The smart-me M-BUS Gateway connects M-BUS Meters directly to the smart-me Cloud. The Device has an integrated WiFi Interface and so you don't need any additional Hardware. It uses the existing WiFi Network and upload the Data of different Meters (Electricity, Heat, Water, Gas and Temperature) directly to the smart-me Cloud. The “smart-me for Kamstrup Omnipower” module connects your Kamstrup Omnipower meter directly to the Cloud. So you can monitor it from anywhere with your smart phone, tablet or computer. You don't need any additional hardware. 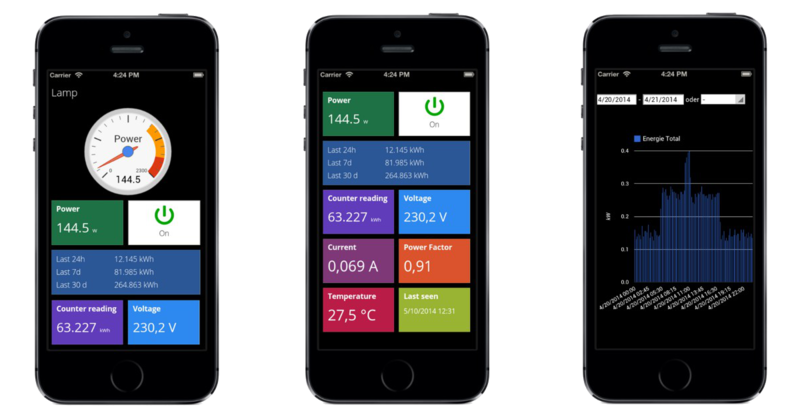 The module connects to the existing WiFi networks and this allows you to view your Energy consumption in real time! An incredible cheap solution to make your energy smart. The smart-me module integrates the measured data of the energy meters L+G E450 and E350 into the smart-me cloud. No additional hardware is needed. The module uses the existing Wi-Fi network and connects directly with the smart-me cloud. This is the easiest option to analyse and optimise the consumption of energy with the help of a smartphone, a tablet or a computer in real time. 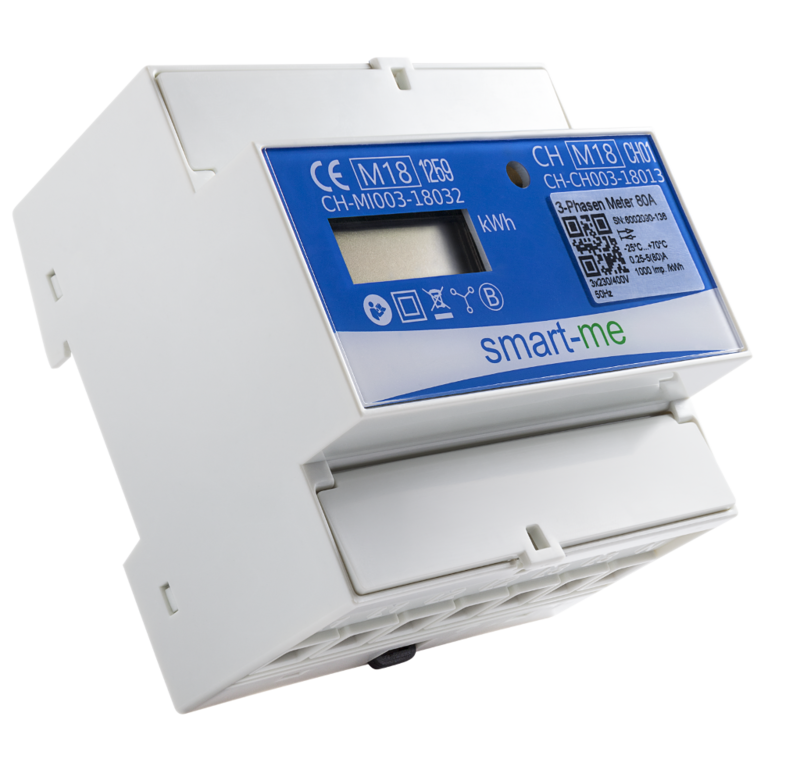 To use smart-me you need Meters with M-BUS support and a M-BUS data collector. The M-BUS data collector reads the values from the meters over M-BUS, converts them to a SML File and upload it to the smart-me Server. You can use any M-Bus compatible meters. It does not matter whether it is a power, water, gas and heat meters. A list of M-BUS counter you can find here. The M-BUS data collector TCP / IP periodically reads from all connected M-Bus meters and upload the data on the smart-me server. You can connect up to 60 meters per data collector. If you want to connect more than 60 devices, or you have multiple locations, you can easily use several M-BUS data collectors. The installation is very easy. You can buy the M-BUS data collector TCP/IP here: M-BUS bata collector from EMU Electronic Ltd.
After you have setup your smart-me account login into smart-me. You will see a User name and a password for your API access. Go to the website of your data collector and select the menu "Configuration -> FTP". Activate the FTP upload, select the type "SML file" and enter your FTP data. You meter data will be uploaded now to the smart-me server and are ready for your reports. If something goes wrong, you can find more detailed instructions <a href="MBusLoggerInstallation.aspx">here</a>. Einfache und kostengünstige Erfassung und Visualisierung von Verbrauchsdaten wie Strom, Gas und Wasser über vorhandene S0-Zähler oder optische D0-Schnittstelle. Die Kanäle sind über die lokale Webseite individuell konfigurierbar und können auf den jeweiligen Zählertyp abgestimmt werden. Die Anbindung an das lokale Netzwerk erfolgt standardmäßig über die LAN-Schnittstelle. Verfügbar sind die Optionen WLAN und UMTS/LTE. Gehen Sie auf die Webseite des Datenloggers. Bitte hinterlegen Sie den API Benutzername und das Passwort unter "Konfiguration → smart-me Zugangsdaten". Nach dem Senden wird der Zugang verifiziert und der Erfolg des Login-Vorganges angezeigt. Nach der Änderung/dem Anlegen der Zugangsdaten erfolgt ein Neustart der Monitoring-Software im Hintergrund. Die Zugangsdaten für das smart-me Portal werden übergeben, die Messdaten können übertragen werden. Im Zuge des Neustarts erfolgt der Abgleich der angelegten Messkanäle mit den Kanälen auf dem Portal die Identifikationerfolgt über den Titeldes Kanals. Das heißt, sollte ein Kanal lokal vorhanden sein (neu angelegt) und nicht auf dem Portal, wird automatisch ein neuer Kanal auf dem Portal angelegt.